Water-based liquid polish that eliminates the tedious and messy buffing required of petroleum-based products. Simply polish, rinse, and dry to achieve a brilliant shine. Water-based liquid polish that allows you to polish, rinse, and dry. Eliminates the tedious and messy buffing necessary with petroleum-based products. 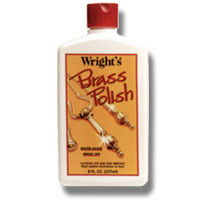 Wright's Brass Polish cleans and polishes to a high luster shine.